The Franklin & Marshall men’s basketball team started off the 2018-1019 season on fire with three straight victories against Albright, Alvernia, and Hobart. Their 85-84 victory against Hobart earned them the championship title of the William Marshall Tip-Off tournament. However, the Diplomats fell to their next two competitors, Gettysburg and York. F&M lost to York in a crushing 74-78 overtime thriller. Nonetheless, the Diplomats bounced back this past Thursday, November 29 to defeat the Dickinson Red Devils in a strong 67-53 victory, making them 1-1 in the Centennial Conference. Diplomat starters included sophomore Matt Redhead, senior J.C McGrath, sophomore Justin Kupa, junior Mike Rice, and junior Ignas Slyka. Starting for the Red Devils were freshman Chris Bates, senior Elijah Wright, senior Mike Hinckley, junior Bryce Allen, and freshman Adam Drummond. Dickinson jumped out with a 2-0 lead from a layup made by Wright. Franklin & Marshall responded with a layup by McGrath, assisted by Kupa.The Red Devils led the Diplomats by a range of one to three points in the first four minutes of the game. Matt Redhead was able to tie the game up at 10-10 with a layup. The Diplomats took their first lead (12-10) of the game at the 14-minute mark with a layup from Kupa, but the Red Devils reclaimed the lead with a three pointer from Drummond. The lead between the Diplomats and Red Devils went back-and-forth in the middle of the first half. Redhead put the Diplomats ahead at the 10-minute mark with two made free throws, making the score 17-16. Franklin & Marshall went on a 12-0 run to put themselves up 29-16 with 5 minutes remaining in the half. Redhead scored 11 out of these 12 points. The Diplomats maintained their lead, going into the second half up 10 points with a 36-26 lead. F&M shot 68% from the field while Dickinson shot a low 33% in the first half. Franklin & Marshall held a steady lead against Dickinson throughout the second half. McGrath scored the first 4 points of the half with two layups, assisted by Rice and Kupa. After a few Diplomat turnovers, the Red Devils were able to narrow the gap to 8 points, making the score 40-32. However, the Diplomats never backed down and maintained their lead with some aggressive drives to the rim from Kupa and sophomore Les Thomas. The Red Devils were able to close the gap to 7 points after a layup from Michael Jurzynski, making the score 38-45. 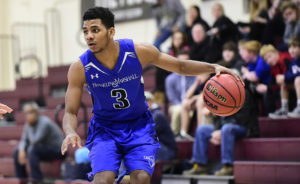 Dickinson increased their backcourt pressure in the latter part of the second half, but F&M was unphased. F&M’s Slyka dominated offensively and defensively in the last 10 minutes with 9 points and four steals to help stretch the Diplomat lead to 17 points with the score of 64-47. Kupa made the final two Diplomat points of the game, totaling 14 points on the night. After a Slyka steal, the Diplomats held on to the ball for the final 10 seconds, securing a 67-53 victory. Redhead led the Diplomats in scoring with 18 points. McGrath led the team with 10 rebounds. Kupa led with 4 assists. Slyka led with 8 steals. The Diplomats will have to build off of this impressive performance when they face off against No. 8 Swarthmore this Saturday, December 1 at Swarthmore. First-year Jamie Belfer is the Layout Assistant. Her email is jbelfer@fandm.edu.